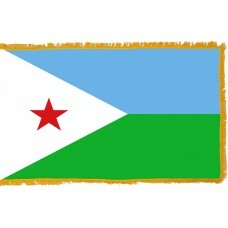 The Djibouti flag features two equally-sized bands of color that run horizontally; blue at the top and green at the bottom. On the hoist side is a white isosceles triangle. In the center of the flag, within the white triangle is a red star which symbolizes blood and unity. The green band of color represents the everlasting green of the earth, the light blue band of color, the sky and the sea, and the white of the triangle symbolizes peace. The blue color also represents the Somali people, and blue the Afar. These two groups make up the vast majority of the Djiboutian population. Together with the white color of peace, the Djibouti flag is a symbol of the strides the country has made to forge a stable, peaceful nation. As with most African countries, Djibouti has a colonial past which forms a large part of its identity. The red star on the hoist side of the flag is a reminder of the struggle to gain independence. Djibouti was a French colony until 1977, and the French language is still widely spoken in the country. Djibouti is situated on the Horn of Africa, a part of the continent which is very close to the Arabian Peninsula. At its narrowest point, Djibouti is only about 30km away from Yemen. In fact, there are plans to build a bridge between the two countries, which would join Africa and Asia. Djibouti is part of the French Somaliland. The country developed rapidly around the railroad between the port city of Djibouti and Addis Ababa in Ethiopia. Thcountry is an important location as a point of contact between Africa and Arabia. For centuries, Djibouti was ruled by Sultans, an Arab term meaning sovereign. It was originally part of the Land of Punt, mentioned in ancient Egyptian hieroglyphic texts. The Red Sea borders at its north eastern boundary. The countries sits between the sea and eight mountain ranges, which are part of the Great Rift Valley. Although on the continent of Africa, Djibouti is actually situated on the Arabian Plate, part of the earth's tectonic structure. This physical connection is one of many connections with Arabia which continue to be important in the country. As well as mountainous areas, Djibouti is largely covered by desert. It is a very hot, dry country throughout the year, especially in the eastern part of the country. This area is low lying and subject to harsh sunlight almost constantly. Temperatures in the summer can reach above 40 degrees Celsius. Djibouti has a massive service sector, fueled by its position as a hub for strategic worldwide business and political operations. Although the country has a rich cultural history and beautiful scenery, it has not yet emerged as a popular tourist destination.